So anyway, when it comes to weaves and other handmade stuff, I still think that the best place to buy it is here. Yup, in the Philippines! We are home to some of the most beautiful tribal patterns in the world and cheaper too! I hope that by featuring these locally made pieces in my ootd's, I can help to promote our local products worldwide in my own little way. But I can't take total credit for it. Just like in my previous post, this too is inspired by Sarah Meier's Postura Project from a couple years back. It's main mission was to inspire people to wear at least one locally made piece everyday. I know I reported the shirtdress as one of this year's hottest fashion trends but me turning it into a daily staple was more accident than premeditated. The trend thing slipped my mind. I just saw this shirtdress on sale while shopping at Levi's and I thought it looked cute so I bought it, since then I've just been finding a lot of shirtdresses similar to this at most end of season sales I've visited. At the end of the day, I am still a mom who needs to adhere to certain budgets! 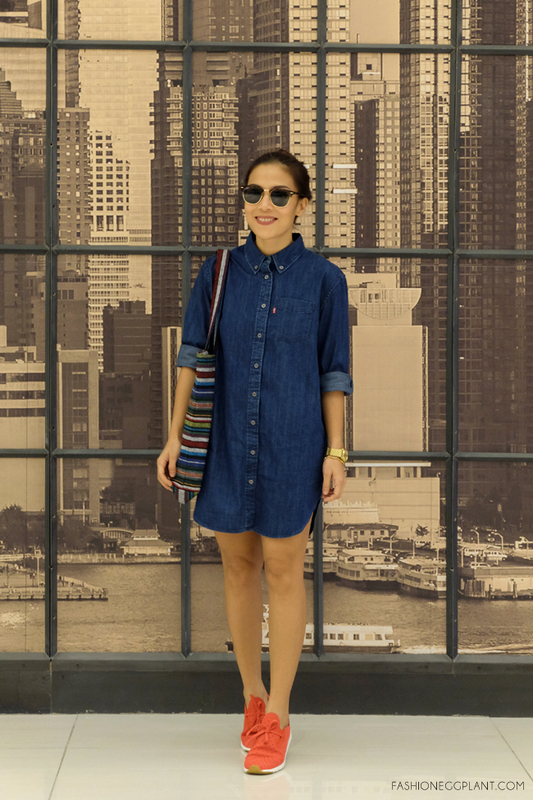 I love your shirt dress! I think I might also be getting addicted to those. I almost always find myself looking for shirt dresses everywhere, it's unhealthy. I seldom do my eyebrows because I find it hard to make them even. I sure could use a template. Wow. Thanks.. I'm not good in putting eyebrows and this can help me. I also have a similar dress, but I am really shy to wear it kasi I thought it is out of style. Now I think I'm gonna wear it na thanks for the inspiration :) Hope you could also visit my site. You're really rocking that shirtdress. Looks great! Love the whole ensemble... Now I gotta lose some extra pounds to make me look as stunning as you. Love the bag! And the shirt dress too! Pero if fuller figure parang hindi masyado bagay ang shirt dress, what do you think? I don't know if I can pull off this look. Baka magmukha akong naka maternity hhaha. I still have to have your figure. I love your OOTD here Sarah! So simple and yet so chic. I super love the look. I hope I can replicate that OOTD, too.